If you have a newborn baby, then you will probably do anything to get him or her to stop crying. Especially when you are the one who needs to get some sleep. Some, but not all, babies can be lulled to sleep by rocking. 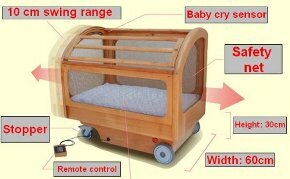 This is why some researchers at Kyuushuu University in Japan have developed the Suima crib. As you can tell by the picture, the baby goes into the little lobster-trap of a crib to get his or her nap time. See the “baby cry sensor” located on the top of the crib? When the Suima crib detects the baby crying, it can rock back in forth. If your baby is the type who is comforted by rocking in your arms, this is a way that you can give your arms a rest while baby gets his or her rest. I’m not certain whether or not we should try and improve on the Suima crib. After all, I once heard of a story where a group of babies were given food and sleep, but no human contact in any way. I have no idea if this study is real and would never be duplicated today, but the babies, deprived of human contact, died. My point is that human contact, such as holding the baby, is often no substitute for a machine. However, if you want to see if this works for you, you can purchase the Suima crib for $4,500 to $5,500, or rent it for about $100 a month. What is the accuracy rate of the suima crib?